This is the website of The Dutch Bushcraft Foundation. We represent a large community of bushcrafters. We are a non-profit organization, promoting a bushcraft lifestyle and living with nature. We are building a European Bushcraft Community. Feel free to join us! Twice a year ‘Stichting Bushcraft’ organises the so-called Bushcraft weekend – the Dutch version of the Wilderness Gathering or Bushmoot. This weekend is a social event which brings together 250-300 participants that attend the weekend to learn from each other and expand their knowledge through mutual skill sharing. That is our successful formula; participants teach and share their knowledge of bushcraft, survival and primitive living skills. The techniques covered and skills taught are very diverse and range from fire making, recognition of edible plants, tracking, to buck-skin tanning, pouch making, orientation in nature and many, many other topics. Our (free) workshops are diverse, as are our participants. Those who love nature and the outdoors, including (young) families, join our weekends! Bushcraft schools and shops are welcome tot present themselves at our bushcraftweekends. You get your own spot on which we call the marketplace. You can demonstrate your skills or promote products for an audience. We have a large network and consult with governments and nature-organisations to promote bushcraft in The Netherlands. 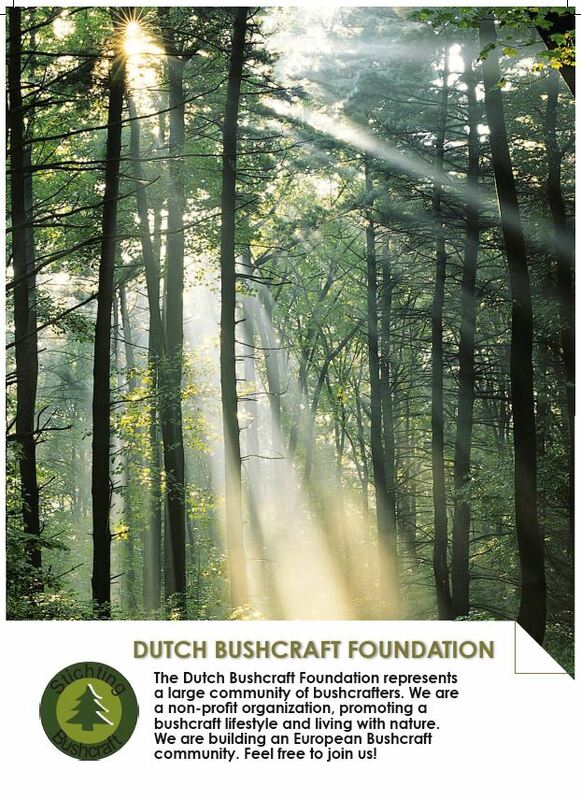 The Dutch Bushcraft Foundation likes to meet other bushcrafters from all over Europe. We want to exchange knowhow and connect countries. We are working on an international network. Let’s make bushcraft limitless and built an European Bushcraft community. Come and expand your horizon at the Dutch bushcraftweekends!